We come now to the last part of this series. In my three previous articles I discussed myths numbers one to eight. Let us conclude with the last two myths. The most basic and ideal rule in investing in the stock market is to “buy low and sell high.” Ironically, what most stock-market players try to do is to “buy high and sell higher.” Unfortunately, they end up “buying high and selling low.” It comes as no surprise, this happens to most people because they succumb to “market” sentiment. Their buying decision is dictated by fear and greed. When the overall market sentiment is fearful, then most would stay out of the market. This usually happens when times are tough or when the economy is in bad shape. However, when the overall economic and business climate is good, most people jump into the stock market. I remember sometime in early 2008 when the world economy was going to hell. I was telling a friend to open an online stock-market trading account. She told me when she went to the bank to open her account, a bank employee asked her why she wanted to get into the stock-market when the world economy was in such a bad shape. I told her, this is precisely the perfect time one should get into the stock market. This is the time to see the glass is “half full.” Value investors dream of times when the economy is so bad the stock market virtually gives stocks away. To most Filipinos, the idea of “investing” is either about parking money in the bank or buying a piece of real estate. As a result, they miss out on investing on the greatest moneymaking machine ever invented by man—the stock market. When prompted to invest in real estate by a friend, Buffett was said to have replied “Why should I buy real estate when the stock market is so easy?” Wondering what Buffett meant by this? Let me quote from a famed value investor, Peter Lynch in his book One up on Wall Street. In Chapter 3 of the book, he wrote that, for 362 years the Indians of Manhattan has been subject to cruel jokes because they sold the entire Manhattan Island for trinkets and beads (worth $24) to immigrants. However, it turns out they made the better deal than the buyers who got the island. Had the Indians invested the $24 at 8 percent per annum, compounded over the next three centuries, the amount today would be around $30 trillion US dollars. Even if you reduce the interest rate of return to 6 percent per annum, that still translates to around $56.2 billion US dollars. This is a bigger sum compared to what the entire Manhattan Island is worth today, based on tax records at the time of the writing of the book when it was worth $28.1 dollars. Although Peter Lynch did not refer directly to stocks, the example may still be cited as a classic illustration of how stock investments will beat real estate if we assume the given rate of return to be that of stocks. Investing in stocks is investing in a business and without a doubt, investing in businesses is more profitable than investing in real estate or any other vehicle of investment if done correctly. 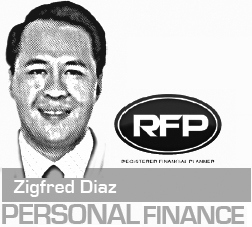 Zigfred Diaz is a registered financial planner of RFP Philippines from Cebu City.